Looking for a cheap holiday to Sardinia? For those who want a low-cost holiday in Sardinia with essential comforts, the Basic Bungalow at Camping Cala Ginepro is the ideal solution for a stay for four people, couples, friends, or family. Equipped with a kitchen and two bedrooms, one double and one with twin beds, this 17 m² mobile home does not have running water, sinks, or a toilet; you'll need to use the common areas for these. The outdoor veranda allows you to spend memorable moments with company, in contact with the wonderful nature. From June until September, the beach service is included in the rate, and includes an umbrella and two sun loungers in the 5th row back from the sea. 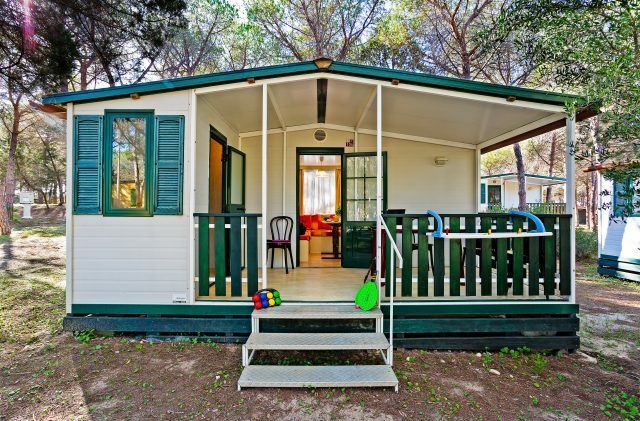 The Basic Bungalow at Camping Cala Ginepro is a static mobile home with four beds, a double bedroom and a bedroom with two single beds, with a weekly bed linen service included. It has a living room with a table and sofas, a separate kitchen equipped with a 4 burner gas stove, an external gas tank, a refrigerator, and pots and kitchenware. The veranda with a table and chairs completes the standard equipment found in the Basic Bungalow mobile home, which is ideal for those looking for a holiday in Sardinia at a modest cost, whilst taking advantage of the comfort of a grounded structure and the use of common areas. And if you're looking for lower rates... Experience Sardinia in spring and autumn! kitchen with a 4 burner gas stove and refrigerator. living room with a table and chairs.